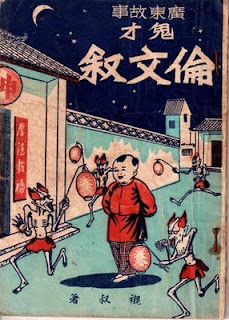 Lun Mun Chui was elated, thanking his Lordship profusely. At the same time the Inspector General heaped praises upon praises to “Universal Illumination” for being such a great teacher. Needless to say, much donation was signed for incense and oils7. With that, the Inspector General returned to his yamen. Need no more elaboration on how the old abbot and Ah Chui respectfully saw the Inspector General off but turning to Ah Chui carrying his fifty taels of silver. Smiling away as he hopped skipped and jumped out of the temple. 2. Sakyamuni , Manjusri (文殊, Wenshu) and Kuanyin. Others opined that the three Buddhas are manifestations of past present and future. 3. 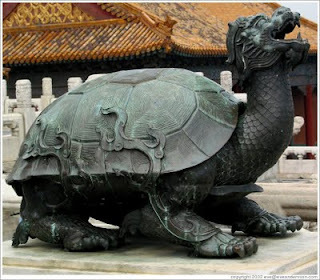 Or a dragon turtle. 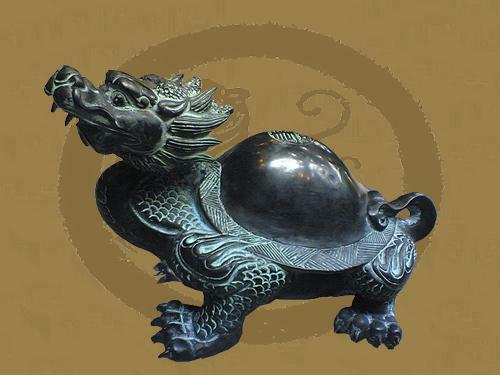 Purported to be one of the nine sons of the Dragon King. 4. In Chinese custom, one should hesitate for awhile so as not to show one’s haughtiness or pride when showing one’s skills and talents. 5. The original Chinese word means “to climb up the social ladder with help from the powerful etc”. To use the words, “ascend” or “mount” or “to ride” or to “attain” will be considered as treasonous words - aspiring to become the emperor himself since the dragon and phoenix are imperial symbols. 6. An Osmanthus Hall can mean a grand hall, the lunar palace and the homes of the scholarly elite. In this context, the 3rd meaning applies. The line means is that with one’s great scholarship, there will be rich and powerful people help to lift him from obscurity. 7. For convenience, no one carries large sums of money (remember in those days, they carry ingots of silver!). The donor signs for the amount and the monks will go at a later date to collect the money. 8. A Cantonese saying, “Termites on the beach, even if they survived, their entire bodies will be so badly battered [by the waves]”. Termites cannot survive out of their temperature controlled environment. Therefore in the harsh climatic conditions of the beach, the termites will surely die. Even if they survived, they will be in real bad conditions. 9. The original text used was “bald slaves”. 11. Brassica juncea, a Chinese vegetable. 1. Brushing one’s teeth – to brag. The word “to brush” can also mean to polish as in polishing off one’s plate. Therefore “to be able polish” - 擦得” means to be able to eat heartily with great gusto and relish. 2. Cantonese for “to take or to grab”, 給, 拿 etc. 3. 潺 means weak, frail in Cantonese.